Several hundred early motion pictures are viewable in the Library's American Memory collections. These collections are profiled below. The Performing Arts Encyclopedia (PAE) is a guide to performing arts resources at the Library of Congress. 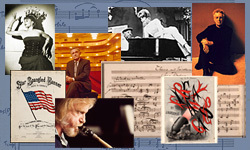 The PAE provides information about the Library's unsurpassed collections of scores, sheet music, audio recordings, films, photographs, and other materials. The Library provides access to a portion of its audio collections through the Recorded Sound Reference Center's web page, theAmerican Memory site, The Performing Arts Encyclopedia and the American Folklife Center pages. A computational knowledge engine. Enter what you want to calculate or know about.